Amy Devers, a graduate of Ypsilanti High School, has spent the last decade honing her design skills and featuring her work on national television. You can watch her on the Oprah Winfrey Network’s “Home Made Simple” on Saturday, Oct. 19 at 9 and 9:30 a.m. Photo courtesy of PGPR. 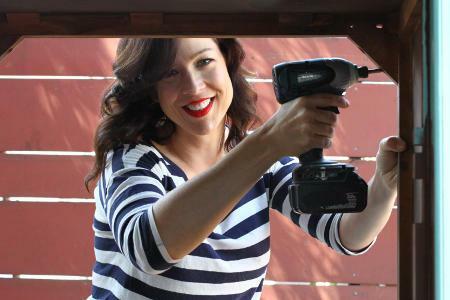 Ypsilanti native Amy Devers has carved out a name for herself in the world of carpentry and home improvement. Devers, a furniture designer now based out of Los Angeles, has been featured on several national television shows including “Trading Spaces,” “Freeform Furniture,” “Fix This Yard” and “DIY to the Rescue.” Now, you can watch her on the Oprah Winfrey Network’s “Home Made Simple,” hosted by Soleil Moon Frye, on Saturday, Oct. 19 at 9 and 9:30 a.m.
“I took a very circuitous route to get here,” Amy said of her journey from Ypsilanti High School to television. After graduating high school, Devers studied fashion buying and merchandising at the Fashion Institute of Technology in New York, but it wasn’t a very good fit for her. “I got really interested in what my friends in the more creative natures were doing. I started building small 3D models, doing things like lamps and picture frames. And I kind of got the bug. But I wasn’t really sure what I could do with that,” Devers said. She graduated from there with a two-year degree. “After that I kind of went to find myself for a couple of years. I started working and I went on a road trip with some friends. We kind of ran out of money in California and just stayed there for a little while,” she said. She found herself in a one-bedroom apartment with three other roommates. After that, Devers attended Saddleback Community College in California for a short time before pursuing furniture design. “I made a bee line for San Diego State University, enrolled in furniture design and never looked back,” Devers said. Following her undergrad, Devers took a job as a machine shop foreman before moving to the East Coast to obtain her masters in furniture design at the Rhode Island School of Design. “That was an incredible two years. I say it was like the most amazing two years of my life, but I feel like I aged 10 years. It was super duper intense, but it was wonderful,” Devers said. She moved back to LA and took up work as a contractor before she had the means to open her own design studio, which she still manages today. “Then this sort of magical thing happened,” Devers said. Her friend came to her with news that a casting director was looking for a female lead for a home improvement show. Landing her first television job served as a catalyst for the next decade. Since then, Devers has traveled the country and the world over, honing her design and home improvement skills and profiling world-famous designers on national television. Devers, now 42, said that of the many opportunities that her television career has afforded her, “Home Made Simple” has been the most rewarding. “The core of that show is that we’re helping needy people. We’re doing nice things for people who are doing wonderful things in their community,” Devers said. “There is a very philanthropic, love-based angle to the generosity that happens on that show… It just makes me heart expand. “That’s what I really love about the show and about the work in general. If you can do something that supports other people supporting other people, it’s super rewarding,” she said. When she’s not on television, Devers said she spends her time tinkering in her Los Angeles design studio, Amy Devers Art/Design. “I love pushing materials to do different things, using materials that aren’t typically used in new ways. My studio is really more of an inventor’s lab,” she said. Between her job as a designer and television host, Devers said she doesn’t often find time to make it back to Ypsilanti, but she does miss her hometown.